Australian Jamie Mitchell made history Tuesday by winning the inaugural Nazaré Challenge at Praia do Norte in 30-to-40-foot surf. The veteran waterman was a clear standout throughout the day, skillfully negotiating the uniquely tricky lineups for his first-ever Big Wave Tour win. Seeing off an early challenge from veteran Brazilian Carlos Burlé in the final, Mitchell came to the fore with a huge left, using a trademark rail-grab off the bottom to maintain control, to breathtaking effect. 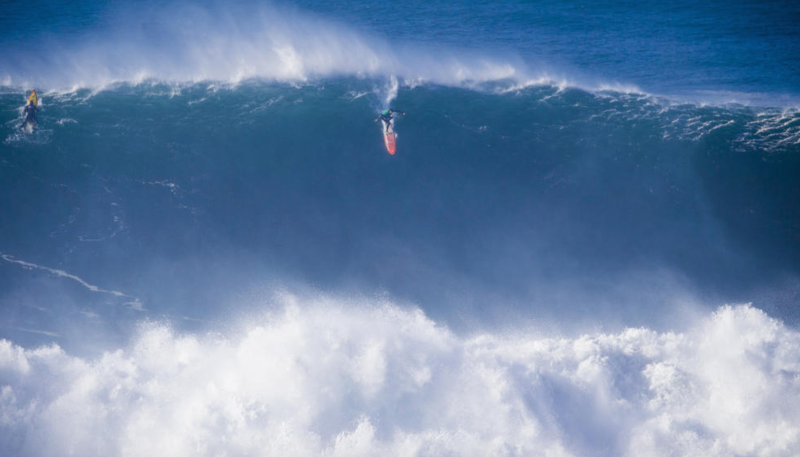 His backup score came at a cost, ejecting at the end of the ride in front of a double up, and popping up a mere split second before the next wave moved over, avoiding a two-wave hold down by the narrowest of margins. 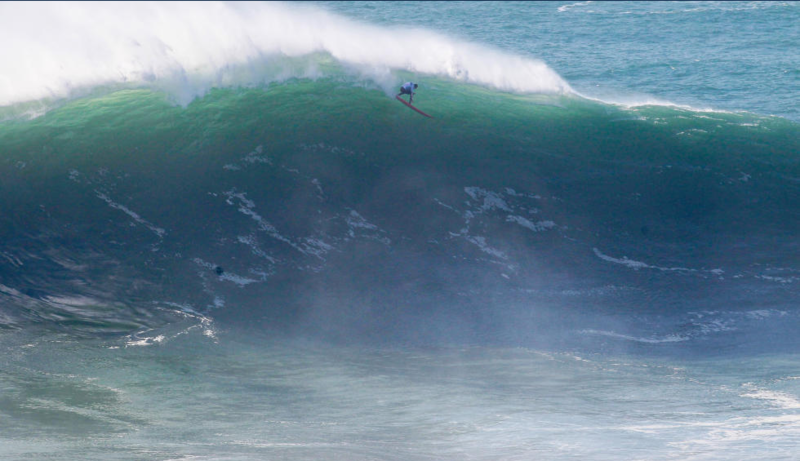 As if paddling big waves didn’t present enough inherent challenges in itself, Nazaré threw up further tribulations aplenty. Not so much a beachbreak on steroids as beachbreak gone Godzilla, workable channels, lineup markers, distinct peaks and at times even manageable shoulders to kick out of were but distant longings. As dawn broke with temperatures barely hovering above freezing, a set of three giant wedges unloaded under the famous cliff and more or less set the tone for the day; wave form brutalism, oceanic violence so ugly it actually became a thing of beauty. Indeed, as something of a rarity on the big wave scene, event organizers were willing modesty, hoping conditions wouldn’t be “too big” at Praia do Norte. With a unique offshore bathymetry funneling and amplifying swell, too much size can take the spot way out of paddle realms. Right on cue, a moderate-to-solid, long-period Atlantic swell delivered faces up to 30-to-40-feet, making for an historic day of big-wave competition. Much as the town of Nazaré itself marries a storied, often tragic history of sea-faring exploits with its contemporary guise as a world-famous surf spot, the Final hosted a blend of experience and youth. Pedro Calado, just 20 years old, has made every Final on the BWT in 2016, and Carlos Burlé, 2009 Big Wave World Champ who’ll turn 50 next year, bookended the age range. Mitchell, Nic Lamb, Joao De Macedo and Antonio Silva were in between. It was Lamb who took perhaps the worst that Nazaré had to offer: He two horrific beatings in the Final that sent him back to shore to regroup. Shaken, but not disheartened, he frantically called for a ski to take him back into the maw. As early exchanges were scant, things almost descended into a wipeout contest. Joao De Macedo was next to feel Nazaré’s wrath, with a nasty scorpion at the bottom of an ultra-late drop that broke his board. Later, toward the end of the Final, De Macedo was again sent to beach by dint of a savage beating, and by the last, closing horn, wore the look of a man who gone 12 rounds with the most feared heavyweight in the North Atlantic (basically, he had). In contrast, Mitchell, who’d been the very the picture of a measured risk-taker throughout the day, carried both the winner’s smile and the athletic composure of a man whose endurance has seen him win 10 Molokai-to-Oahu paddleboard races. 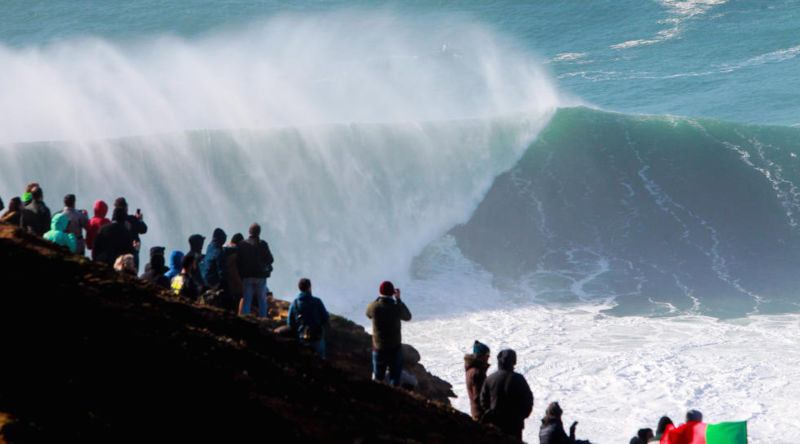 Just a day ahead of the winter solstice, Nazaré appeared to be not merely oceans and climate zones away from the last BWT event, which ran at Maui’s Pe’ahi, but almost on a different planet. Icy wind was blowing off of snow-capped peaks of the Iberian interior, adding a sinister edge to an already-foreboding scene, and it was unsurprising that the day didn’t pass without some heavy beatings from the break. England’s Tom Butler wore a nasty lip that saw him retire midway through his heat, while Damien Hobgood didn’t even make it past the shorebreak to contest his Semi. Losing his board off the ski on his ride out with Garrett McNamara at the helm, a pause to retrieve it proved costly; caught inside, the ski rolled, and and Hobgood, now injured, couldn’t continue. Nic Lamb barely made it on to the podium, due to a concussion sustained from his beating in the Final. Ultimately, though, as the wintry sun dipped to the west and wounds were licked, it was the most composed man in the field who stood atop the podium a combination of delight and respect for the hallowed waves of Praia do Norte. 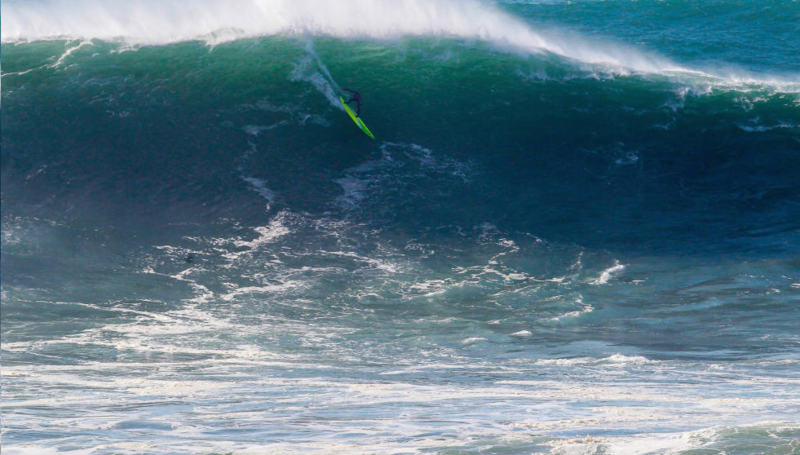 The first-ever BWT event to run at Nazaré, coupled with Mitchell’s own first win, served to make the day even more momentous in the annals of big-wave riding. Words & Photos courtesy of the WSL.